After leaving the autoroute at Valence d'Agen, junction 8 follow signs for Golfech. After crossing the canal by the power station turn right at the roundabout. Turn left at the next one following signs for Cahors. After Lalande, ignore the first 2 signs for Castelsagrat and look out for a small road, on the left, opposite some rubbish bins and just after a large house with a tower, called Lamothe. There is a Chambres d'hotes sign on the corner of this road and we are 2 kms up here on the left. If leaving the autoroute at Castelsarrasin, junction 9, turn left at the roundabout for Moissac. Cross the river Tarn and the canal. 200 m after the canal, turn right on the D7 direction Bourg de Visa. At the first roundabout at Fourquet, turn left, direction Valence d’Agen. Turn right after 800m, at Chambres d’hotes sign, opposite the rubbish bins. 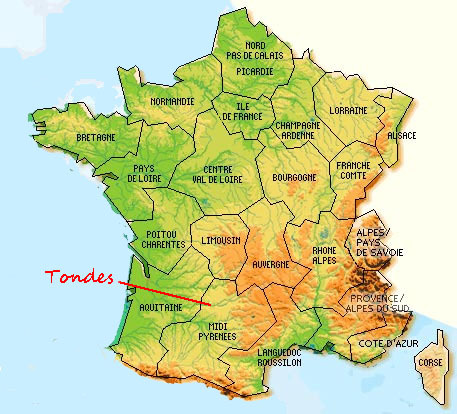 Tondes is 2kms on the left, the farm at the top of the hill.